The land where heaven touch the earth. Hot spring & snow capped mountain make North Sikkim as heavn in earth. It falls in the northern district of Sikkim & Mangan is the headquater. The Land full of unfamiliar experiences start Kabi Longtsok, Phodong, Mangan, Seven Sisters, Singhik & Chungthang are the major places to be covered on the way. In Chungthang, the confluence of river Lachen cu & lachung chu take place & give a rise of river Teesta in north Sikkim. After chunhthang, one way goes to Lachen (Gurudongmar Lake ) & another for Lachung (Yumthang Valley). 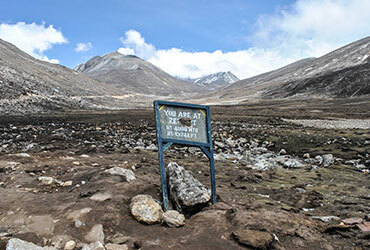 North Sikkim is a restricted area and one need to have special permit. Located at a high of 2500 metres (8210 Ft). It's a small town and also a army cantonment for border protection. You can visit monastery, handicraft centre, go around for village. If you are interested then you can do trout fishing. 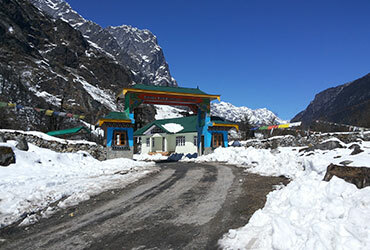 A Bhutia village has a unique local self-governing body called the Zumsa which substitutes the Panchayat. 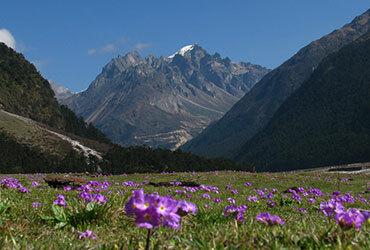 It is located about 25 kms prior to Yumthang Valley. To get a glimpse of Lachung Monastery you have to come to the opposite slope of the highway. 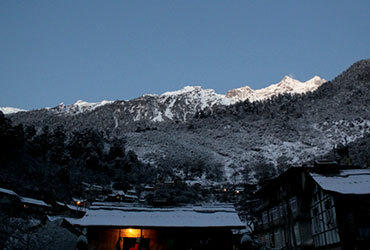 One need to stay in Lachung to pay visit of Yumthang Valley. The breathtaking views can become a part of timeless scene without any kind of instruction. One can see the hot springs, it is rich with sulphur, Emanates usefull for skin problem. It is difficult to images of hot water in its natural form in these cold place. To see colourful flowers by the side of road. The Valley has an astounding, over 24 species of Rhododendrons which paint the Valley red in spring. Rhododendrons are shrubs or trees, and different species of Rhododendron cover different large stretches of the Valley. In April and May, the snow peaks start melting and frozen streams start running with fresh water. One gets a glimpse of beautiful flora and fauna of Great Himalayas. Lachen is a scenic mountain village at a heights of 8500 Feet above sea level. The village has magnificient surroundings with grassy mountain slopes on one side and imposing snow capped peaks, glaciers and rock cliffs on the other side. The village is located in a picturesque valley surrounded by conifer and Rhododendron forests. located at a height of 17100 ft, is among the top 15 highest lakes in the world and is the second highest lake in Sikkim as well as in India. Being the second highest lake in India, the panoramic and scenic beauty of the place is a sight to behold. Named after Guru Dongmar, the lake has a religious appeal. The view of Mount Siniolchu and Khanchendzonga is breathtaking from that point. 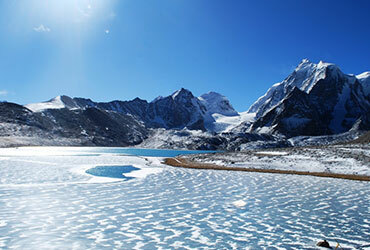 Surrounded by snow clad mountains and crystal clear icy water, it is considered to be a very sacred lake both by the Hindus as well as the Buddhists. It is said that Guru Padmasambhava (also known as Guru Dongmar), touched and sanctified the lake, and thus, even in extreme winter, a portion of the lake does not freeze. The lake is also one of the sources of River Teesta, which flows through Sikkim, West Bengal and Bangladesh and meets the Bay of Bengal. There is paucity of oxygen at such a height, and thus, staying there for longer period is not recommended for most tourists. Located at the heights of 15, 310 ft. It is place which is very lose to Indo- China Border. It s a land of perennial snow but this valley is also used as a grazing ground for nomadic shepherds. Heady, invigorating and exhilarating, words would fail to explain the experience of being at Yumesamdong.